This chapter examines the process by which the principal of the Irish national debt was increased fourfold in 1729–1730 and the evolution in Irish taxation policy which accompanied that occurrence. It also assesses wider attitudes at the time towards parliamentary taxation and a national debt and the proposal for increasing it and offers a detailed analysis of the political and parliamentary activities relating to the increase in the debt, including the adoption of the concept of direct appropriation of taxation for debt repayment, and the emergence of the idea for establishing a sinking fund. Such considerations also take into account the wider economic conditions of the time and their impact upon public and political opinion. 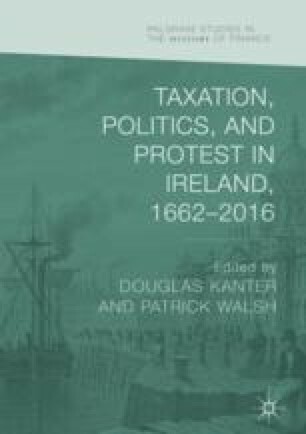 Ultimately, the chapter highlights how the actions of the Irish Parliament in relation to taxation and the national debt in the late 1720s and early 1730s represented a key moment in the evolution of fiscal policy and structures in Ireland and the extent to which public or more specifically Patriot opinion and wider political and economic considerations impacted upon that process.